With headphone jacks slowly starting to disappear from high-end smartphones, the market for Bluetooth headphones stands to become much busier in the coming months and years. Thankfully, Bluetooth 5.0 is finally here with more reliable connections capable of delivering consistent audio. 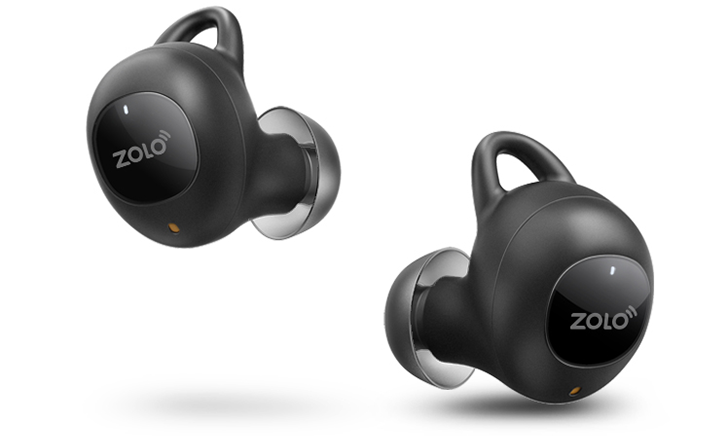 One of the first products to ship with the new protocol – the very first total wireless earbud – is the Zolo Liberty+ from Anker, an upgrade to its Bluetooth 4.1 earbuds that went on sale towards the end of last year. Made possible after a successful Kickstarter campaign that raised $2.8 million, the "zero-compromise total wireless" earbuds are the first to use graphene coated drivers. Anker says this offers clearer sound with deeper bass, sharper highs, and warmer mids. As with the standard Zolo Liberty, the plus version also boasts 3.5 hours battery life, but the additional time provided by the charging case has been doubled to 48 hours. Charging is handled by Micro-USB, which might be slightly disappointing in 2018. 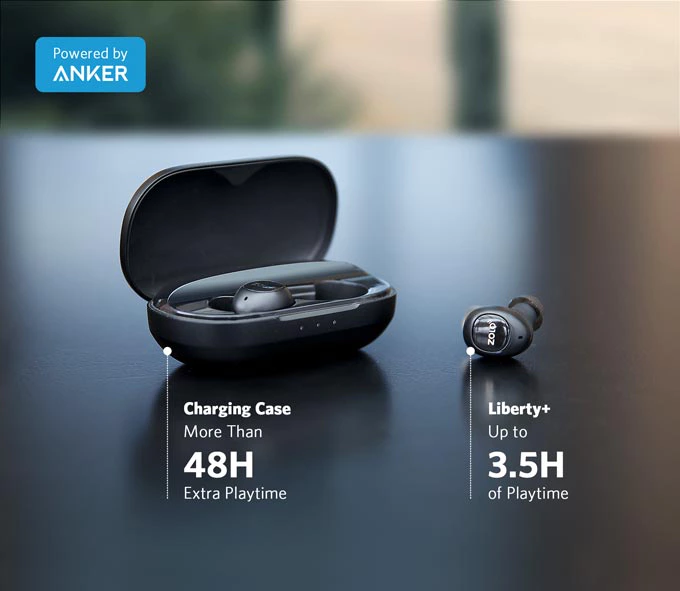 Simple pairing is also being talked up by Anker, with just a single button tap on one earbud when removed from the case before selecting on your phone. I'm not sure that's any simpler than other devices with Google's Fast Pair feature, but it sounds easy enough. The Liberty+ should be good for exercise, with patented GripFit tech locking them in place and an IPX5 rating making sure they're at least sweatproof. Anker is launching the Zolo Liberty+ at CES in Las Vegas this week and has announced availability on Amazon will be starting later in January, at a cost of $149.99 ($50 more than the original Zolo Liberty). You can find out more about them on the Zolo Audio site. Artem has been testing them out recently and is pleased to report that he's not had a single skip yet, so Bluetooth 5.0 seems to be the real deal (Edit: this is nothing to do with BT5.0 and everything to do with a new antenna). LAS VEGAS, Jan. 8, 2018 /PRNewswire/ -- Today, Anker Innovations, a global leader in charging technology and smart, connected devices to support entertainment, driving and the emerging smart home space, announced the availability of the ZOLO Liberty+. The world's first zero-compromise total wireless earphones made its debut on Kickstarter with a campaign that raised over $2.8M. Liberty+ seeks to solve the biggest pain points seen in the wireless earphone market: sound quality, battery life, convenience and connectivity. The Liberty+ is the first total wireless earphones to cover drivers with graphene, a cutting-edge nanosheet of pure carbon. It is 100x stronger than steel at a fraction of the weight, which helps create immersive sound quality -- superior clarity, deeper bass, sharp and crisp trebles, and overall warmer mids. Steeped in Anker's world-class charging technology, the Liberty+ has 3.5 hours of constant playback. Additionally, the charging case will provide 48 hours of power on a single charge. The pairing process with most wireless earphones can turn into a half hour ordeal for novice users. The Liberty+ has simplified this into just two steps. After removing the Liberty+ from the charging case: 1. Push the button on the right earphone; 2. Select "Liberty+" on your mobile device Bluetooth screen. This streamlined approach makes the Liberty+ the easiest total wireless earphones to pair with both iOS and Android devices. Designed for a life in motion, the Liberty+ has an IPX5 rating, meaning they are waterproof and sweatproof. Using patented GripFit technology, insert them the ears and rotate the earphones backwards towards the neck, until they lock in place. This will keep thee Liberty+ in place, even while going for a run or doing other strenuous exercise. The Liberty+ is the first total wireless earphones in the market using Bluetooth 5. It features a LDS antenna, which is the same wireless communication technology as satellites and drones. The entire framework of the earphone amplifies the strength of the Bluetooth connecting signal, resulting in nearly unbreakable levels of connectivity. Available on Amazon in late January the Liberty+ retails for $149.99, To learn more about ZOLO Liberty+, please visit www.zoloaudio.com. ZOLO is Anker Innovation's smart audio brand, is committed to reinventing audio by bringing it into the smart era. This includes premium wireless headphones and beautifully designed indoor and outdoor smart speakers that support popular music services, voice services, and an ever-growing number of compatible smart home products. Anker Innovations is a global leader in charging technology and a developer of connected devices to support smarter audio, driving and the emerging smart home space. This innovation is being led by its five key brands: Anker, Eufy, Nebula, Roav, and ZOLO. More information about Anker Innovations, its brands and its products can be found at www.anker.com.